After a successful first plane ride we had arrived at Epcot! It was also our 1st Visit to Disney World! I was so excited for us, for them. 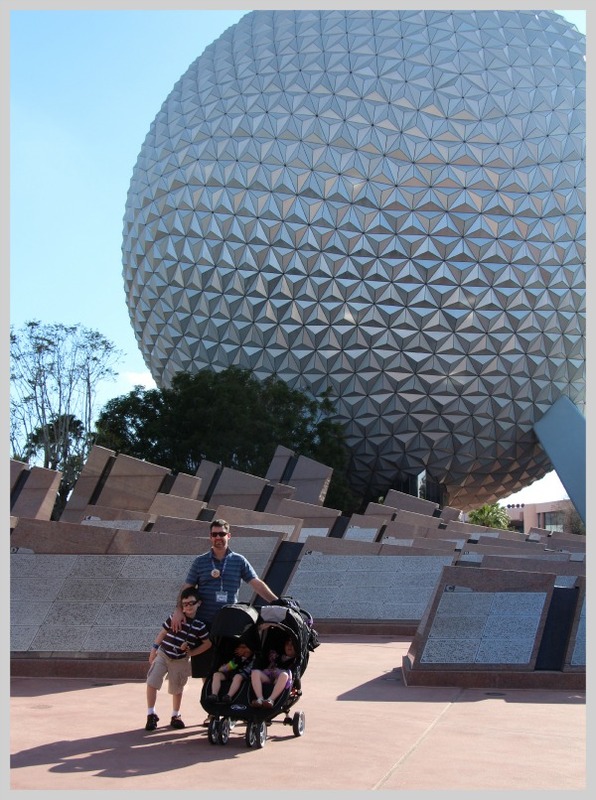 The big boy was duly impressed with the giant sphere that greeted us and we went straight inside it to Spaceship Earth. He has just started to get into history and this was an awesome crash course in the coolest form available – a Disney ride! After travelling through time, we went over to get some Fastpasses for Soarin’. Our very first setback was upon us. Our return time was 8:30, we were bummed. I was pretty sure we’d never make it since the kids had been up at 5:30. We soldiered on and found ourselves on Living with the Land. The first bit was sort of ho- hum but the kids really enjoyed seeing the greenhouses and all the different plants. 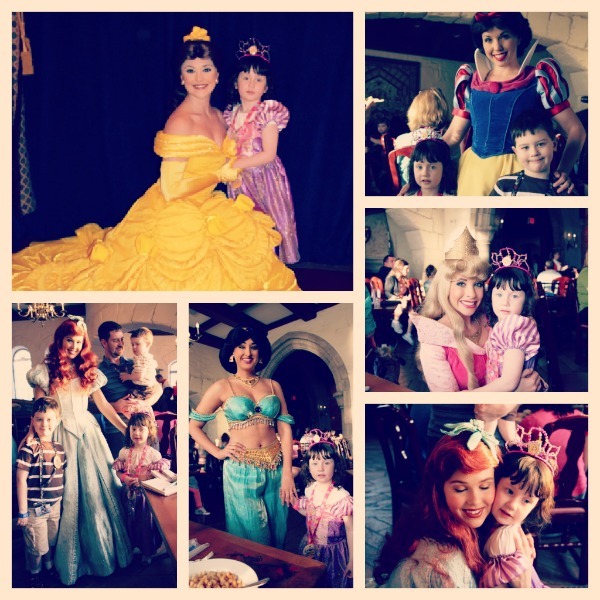 To everyone’s delight Belle, Jasmine, Aurora, Snow White, and Ariel were in da house! My little girl was SO happy. She eagerly waited for each princess with her autograph book in hand. Big boy was into it as well politely asking them for their autographs. Baby boy on the other had was yelling and crying as soon as we sat down. Rather, as soon as I tried to sit him down. He stiff legged me and started screaming and didn’t stop for about a half hour. How is it that people so little can suddenly have super human strength? He wouldn’t eat anything. He wouldn’t drink anything. He wouldn’t DO anything – other than yell.This would be the beginning of what we now call Screamfest 2013. Every time we tried to set him down to eat he would yell. Put him in the stoller? Scream. Have Daddy hold you? Cry. Nana? Shout. Mama? Whimper -ok that’s good. OMG. Did his ears hurt from the plane? Was he getting even more sick? He yelled at Nana for a while as we went on Maelstrom. We put him in the stroller and he settled a bit as we walked over to The Seas for the Nemo ride. At this point we realized we weren’t going to make it to stay up for Soarin’. Wanting to do one more thing we almost walked away from Turtle Talk with Crush. So glad we didn’t! If you have kids under 6, or heck, even over – Go! It’s cute and funny and it lifted all of our spirits a bit. Crush zeroed in on our little family and it’s a really great memory for all of us. Duuuuuuude! We headed home eager to get a good night’s sleep for our big day at the Magic Kingdom! It’s like when you’re putting the kid in the car seat and you can’t even push their stiff little body in. Where does the super human strength come from in a toddler? !